When it comes to portable fencing for sheep, one of the most popular options is electric sheep netting - a portable electric fence option which is very secure and reliable. While rolls of poly wire are an option for setting up internal paddocks for rotational grazing, electric sheep netting is our preference as a temporary or strip-fence option for shepherds, because it provides more security for your flock. A ram will go right through poly wire to breed your ewes, and it's very easy for coyotes and other predators to slip between or under poly fence wire, whereas electric sheep netting properly deters frisky sheep while also doing a nice job to prevent predators from injuring your flock. "Step-In" style metal stakes like the ones pictured above are helpful for installation of your sheep netting. There are many different varieties of electric netting for sheep, but most consist of plastic or PVC fence posts with a metal stake you drive into the ground, and thin poly wire with metal threads woven into it (to conduct electricity), in a mesh grid. While most poly sheep netting does a good job keeping sheep in and keeping predators out, they're not all created equal. Before I get into a few short reviews of some popular electric sheep netting fence options (scroll down if you just want those), I want to briefly run through selection criteria you should consider. Height and Length - obviously you'll want to take note of the length of the roll of sheep netting before you purchase it (this will tell you how many rolls you need to buy ... you can connect multiple rolls to fence larger areas), but height is also an important consideration. For large sheep breeds you'll want a taller fence, but shorter fences tend to sag less over time ... so if you have smaller sheep and few predators in your area then a shorter fence option might be best for you. For the most part, shorter electric mesh fence rolls are best for segmenting interior paddocks, and taller options are best for perimeter fencing, or for temporary paddocks outside your perimeter fence system. General Construction - While most rolls of actual fence wire are constructed similarly, pay careful attention to details like how many fence posts come with the roll (the more the better), what material the stake at the end of the posts is (metal will last longer than plastic), and whether the fencing has plastic vertical uprights. On taller fences, these will help support the spans between posts and prevent sagging, so they're great if you get them. Finally, think about color - often you'll see orange or white, both of which offer good visibility, but sheep seem to pick up the white color better (more contrast with the grass), so if it's your first time using electric netting for sheep, I recommend white (this is a pretty minor factor, though, so I wouldn't sweat it too much). Electric Mesh Grid - The final element to consider when comparing different electric netting fence options for sheep is the size of the grid. Many of the sheep and goat grids have holes large enough for a sheep or dog to get their head stuck in if they try to go through it, which can result in a real tangled mess during first installation, but some of the options with smaller grids (designed for poultry), offer a tighter mesh, which I've always felt is safer and I've also found that it helps the fence hold its shape over time. 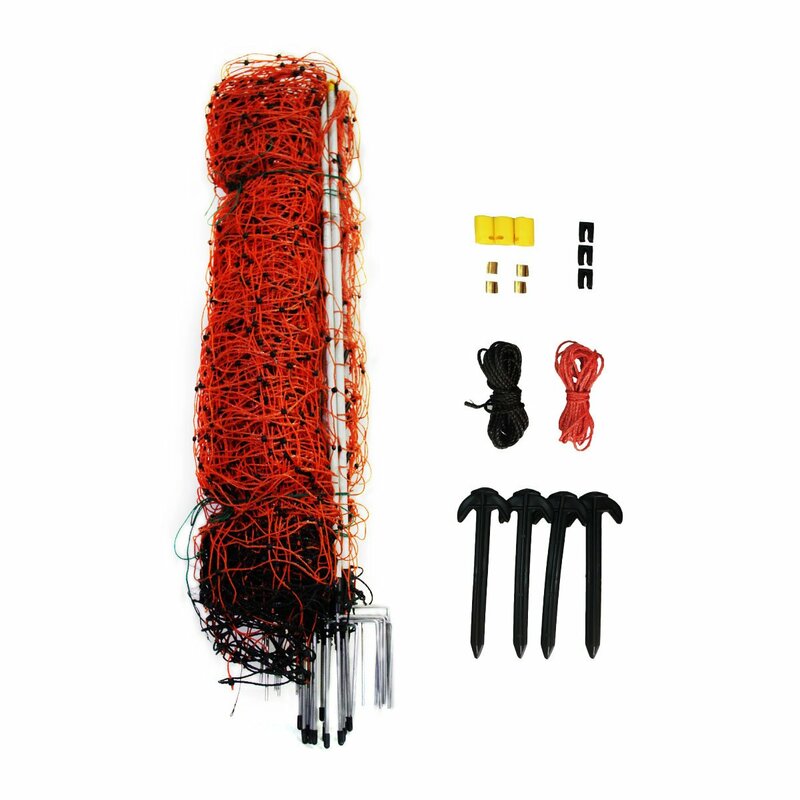 Here are a couple of popular electric netting options for sheep. Each is available for purchase online at Amazon, most are available with free shipping. While this electric netting fence option for sheep is actually designed and marketed toward owners of poultry (is it still free range if they're ranging inside a fence? ), it's actually one of my favorite options for sheep due to the nice tight weave of the electric netting. This fence is a nice bright white color with 48" tall, white fence posts and a sturdy double stake system which help to keep it rigid even in soft soil. This Powerfields P-89-G electric netting is similar to the Premier 1 system above, but it has a single stake system for the fence posts, and the fence posts aren't quite as sturdy as a result. If you're fencing relatively flat stretches and straight runs you won't notice the difference, though they're a bit more challenging to drive into the ground. At 42" high this fence tends to sag less, but it's still an adequate height for sheep. It comes in three colors (green, orange, or white - I recommend the orange or white for visibility). This second option from Premier 1 is less expensive than the first electric netting option on our list, but it lacks the double-stake system on the posts, it's a bit shorter, and you'll notice that the poly mesh grid has much larger holes, which allows the fence to sag and be slightly less secure. All of that said, it's an excellent entry-level option, just be sure to have sufficient charge in your fence (keep the grass down around it) so that your sheep don't stick their heads through the holes in the fence netting. This is the least-expensive option on the market, but in our view you get what you pay for, which is why we encourage readers to choose one of the options listed above. With that said, we know that budget is a concern for farmers, so this electric sheep netting option will be attractive to some due to its price (it typically sells for just over $100 a roll). This fence is not as tall (a full 13" shorter than our top choice), and while it does have a two-stake, step-in system ... some reviewers have complained that the stake and the fence-posts separated. We have not experienced that, but it's worth noting. In another article on this site, we compared the cost to fence an acre of land between high-tensile electric fencing, welded wire, poly rolls, and electric sheep netting, and this is the least-expensive option (5 rolls of sheep netting will cover you for an acre of land). I also like that even if you don't have a permanent electric fence on your property, you can still use this with the purchase of a solar-powered electric fence charger and an inexpensive grounding kit.